As Category 5 Tropical Cyclone Winston left Fiji on Sunday, thousands of families were braced for the after effects, including searching for loved ones, returning to and in some cases rebuilding their homes and beginning the huge task of clean up and reconstruction. 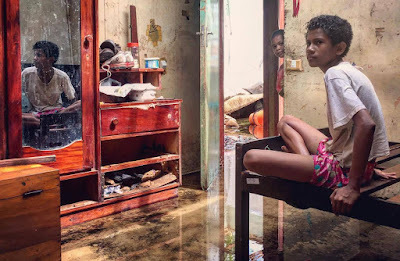 The most devastating natural disaster to hit Fiji in recorded history left no one untouched. All parts of the country experienced strong winds, tidal surges, flooding, power cuts and/or water cuts. Everywhere, children were among the most vulnerable and affected. UNICEF spoke to children and their families across the country to understand the impact of the Cyclone on their lives. Lote’s nephew was one of many Queen Victoria School boarders who walked from their school to the town of Nausori, after their dormitory and surrounding school buildings were ruined. “He is still in a state of shock,” she says. Jean Hutchinson Tikaram, a retired teacher, had to hide in a cupboard with her family while winds battered their home in Rakiraki, in the north of Viti Levu. “We were so scared.We could hear the winds howling and rain hammering on the roof,” she says. Her daughter tweeted in the dark throughout the storm to keep communication lines open with friends and family outside Fiji. In Fiji, UNICEF has for several years supported emergency preparedness and disaster response training for district health and education officers, including how to do rapid assessments and using mobile data. Last year, we facilitated child protection in emergencies training to the Ministry of Women, Children and Poverty Alleviation. These skills are now being put into practice in evacuation centres across the country. UNICEF is working with partners and supportingthe government to help affected families, including those in evacuation centres in the hardest hit parts of Fiji, including Savusavu, Rakiraki, Ba, Lautoka, and Nadi. Our support to the Government’s cyclone response includes assessments, psychosocial activities for evacuated children, education in temporary learning spaces, and providing safe and clean water, sanitation and hygiene. UNICEF has pre-positioned emergency supplies already in Fiji, which are being distributed, but urgently need more given the magnitude of the disaster in Fiji. We need financial support for freight and logistics, especially for the dispatch of supplies to Viti Levu and seriously affected outer islands, some of which are only accessible by boat. After a natural disaster, many people’s immediate reaction is to help by sending food, household supplies and clothing. However, it takes time to clear these items through customs, sort and then distribute them, meaning they reach families much later than anticipated or needed. It is much more effective to donate cash to UNICEF and other relief organisations. UNICEF offices in Australia, New Zealand and elsewhere have set up donation lines where you can send financial assistance. You can also donate online. Your assistance will fund the purchasing of supplies, as well as transport and distribution to affected communities. Every child counts, and time is of the essence.